Depart Newark Int’l Airport on an overnight non-stop flight to Tel-Aviv. Full service on board. Upon arrival in Tel-Aviv, we will be met by our representative. Leave the airport for Caesarea, the Roman Capital of Palestine. Here we view the beautifully restored Roman Amphitheater, the ruins of the ancient town, the harbor and the aqueduct. Continue to Stella Maris for MASS. After Mass drive to Mt. Carmel where Elijah confronted the false prophets of Baal and the Carmelite Order was started. Proceed to Tiberias for dinner and overnight. We depart for Cana, the site of His first miracle. We continue to Nazareth, the boyhood home of Jesus (MASS). From here we drive to Mt. 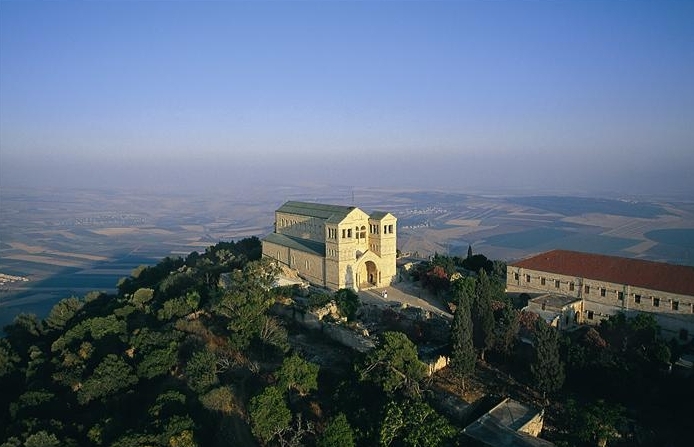 Tabor, site of the Transfiguration. Return to Tiberias for dinner and overnight. This morning we cross the Sea of Galilee by boat to Capernaum and visit the ruins of the ancient Synagogue and St. Peter’s house, visit Mt. Of Beatitudes where the Sermon on the Mount was given (MASS), Drive to Tabgha, site of the Multiplication of the Loaves and Fishes. Visit the recently discovered boat from the time when Jesus lived in Galilee. Before we return to our hotel Tiberias for dinner and overnight we visit Jordan River for our baptism. 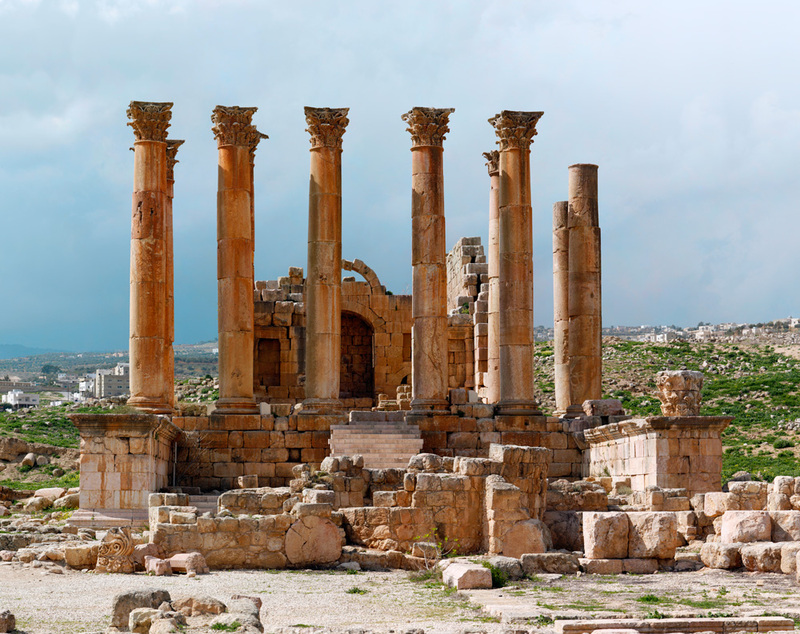 We depart after breakfast for Sheik Hussein Bridge and cross into Jordan and explore the magnificent ruins of Jerash, one of the best preserved Greco Roman cities. Visit its theaters, temple and colonnaded streets. From here we proceed to Madaba, home to a beautiful sixth century mosaic of Palestine. Continue to Mt. Nebo (MASS) and view the “Promised Land” as Moses did and on to Amman for Dinner and overnight. sides. 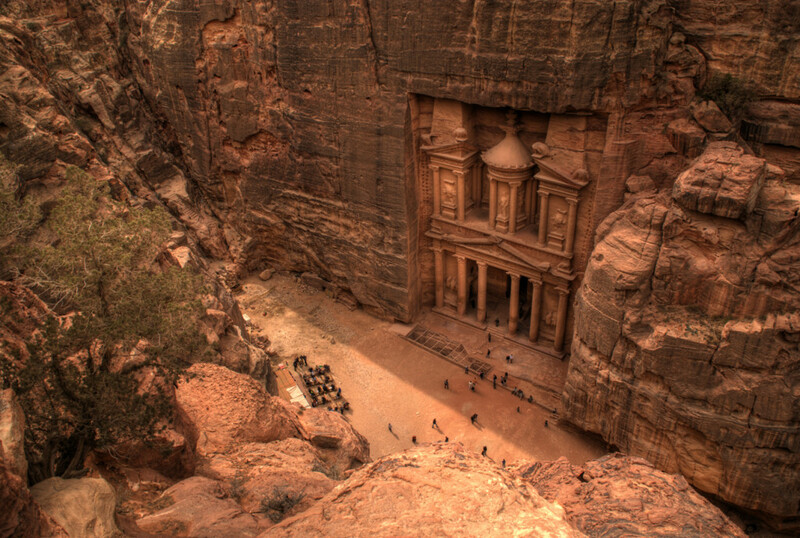 Tour the various Temples, the Amphitheater, the streets of columns and the Treasury. Dinner and overnight in Petra. After breakfast we cross the Arava border into Israel. After a brief stop at Eilat we proceed to Masada and ascend by cable car to the remarkable ruins of this fortress built by Herod the Great, where from 70 to 73 A.D. Jewish Zealots made their last stand against the Romans. After our visit we drive to Qumran and view the caves where the Dead Sea Scrolls were found. 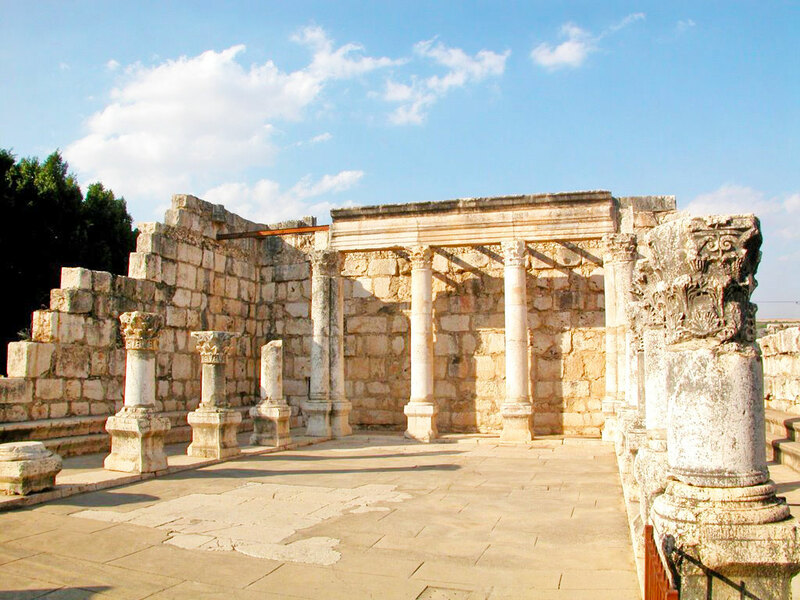 We visit Qasr El-Yahod, the location where many believe John the Baptist baptized Jesus. After a short stop at the Dead Sea continue to Jericho, the oldest city on earth. Here, the walls came down in Joshua’s day. One can see Elisha’s Fountain and Mt. Temptation. We continue to Jerusalem for dinner and overnight. This morning we get to know “Jerusalem the Golden”. We drive to the Mt. of Olives, where we visit the Chapel of the Ascension and follow the path down the Palm Sunday road to the Garden of Gethsemane and the Church of all Nations. A short drive through the Kidron Valley brings us by way of Absalom’s Pillar and Zechariah’s Tomb. We then proceed around Mt. Zion to the Upper Room, traditional scene of the Last Supper. 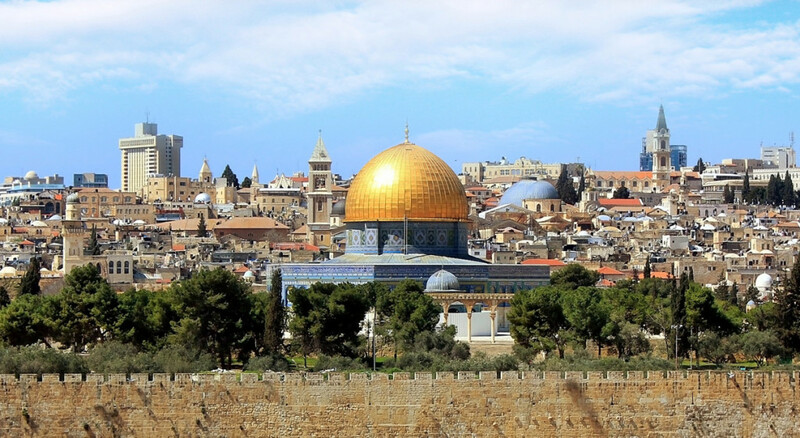 In the afternoon we visit the fabulous model of Jerusalem, depicting the city at the time of our Lord. Then to Yad Vashem, which was built to honor the 6,000,000 Jews killed during World War II. Continued to Ein Karem the birth place of St. John the Baptist and see the Church of Visitation where Mary visited her cousin Elizabeth. After MASS and before we return to Jerusalem for dinner and overnight we visit Emmaus, where the New Testament reports Jesus appeared before two of his followers after His resurrection. Early in morning we retrace the last steps of Jesus. As we walk along the Via Dolorosa (Way of the Sorrow), we visit the Pool of Bethesda, Pilate’s Judgment Hall, the Temple Area and glimpse at the Dome of the Rock and El Aksa Mosque and King David Street. Finally we arrive at Holy Sepulcher for a visit (MASS). We visit the Jewish Quarters and Davidson Archeological Park. Dinner and overnight in Jerusalem. This morning we depart after breakfast for a full day visit of Bethlehem. We first visit Shepherd’s Field(MASS). After lunch we visit the Church of the Nativity. We return to Jerusalem for dinner and overnight. Full day at leisure to explore the Old City on our own for the last minute shopping. After dinner transfer to the airport for our return flight back to Newark. Fifty minutes after midnight we take off on an ELAL non-stop flight to Newark, where we arrive early in the morning of the same day.